Aiken Mid-Day Lions know how to put the FUN into fundraising! Every club must have fundraisers in order to financially sustain the causes they choose to support. The Aiken Mid-Day Club is no exception. Over the years, we have sold brooms and poinsettias, participated in Candy Day, sold tickets for the Belk Shopping Days Charity partnership, judged arts and crafts at the fair and held many a yard sale. No matter what we are doing, you'll always hear the laughter and see lots of smiles. 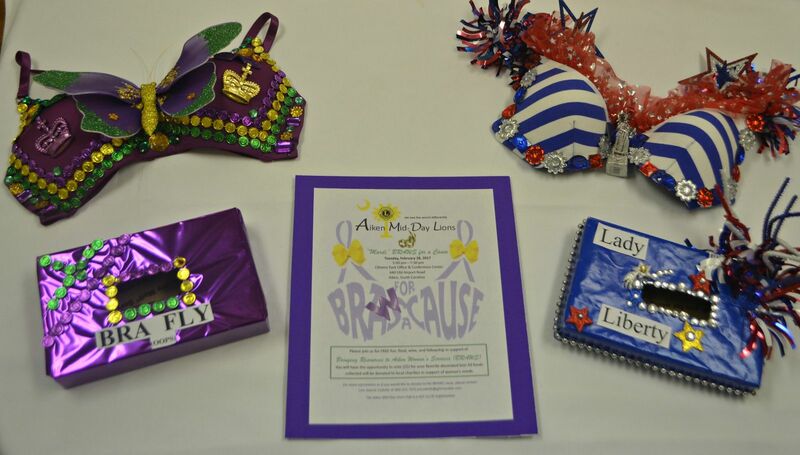 Our newest fundraiser, is Mardi BRAWS for a Cause. "BRAWS" stands for Bringing Resources to Aiken's Women's Services. The purpose of this fundraiser is to raise people's awareness of the need for women who find themselves in unnatural circumstances to have the opportunity to obtain female necessities such as undergarments and personal hygiene items. The money raised is channeled to service organizations that support women in their time of need or crisis. Our Aiken Mid-Day Lions Club (and anyone else who would like to participate!) gathers together in January to prepare our decorated BRAWS and then showcase them on Mardi Gras day. We will have them displayed at a local business and the public may come, enjoy some Mardi Gras festivities and vote with their $$$$ for their favorite decorated bras. This is an uplifting event to help support our area women. Over its fifteen years in existence, the single most significant fundraiser the Aiken Mid-Day Lions Club conducts is our Fashion Show. First held in 1996 at the Wilcox Inn as a way for local businesses to honor their secretaries and clerical staff, the show was attended by 125 local women and the club netted about $700. Since that time, this fundraiser has become a fixture in the Aiken business community as THE event for recognizing Administrative Professionals Day. Each year, the Fashion Show involves every club member, securing sponsors, selling tickets and helping to promote a day in which every Aiken Mid-Day Lion plays a role.